Cucumber is known as one of the most important nutrition elements for the human body. It is a rich source for vitamins, minerals and water, beside it's high importance for a healthy diet. Referring to the origin, cucumbers are defined as botanical relatives of squash, their origin is in Asia and it is easy to grow in hot climates or in the season from May to August. The main benefit of this vegetable is to provide high amounts of water for the human body, especially in the summer season or in hot climates that causes minerals loss with the body sweat. Cucumbers are very low in calorie content. 100gm of cucumber contains only 18 calories, so it is an amazing vegetable for weight loss as it is rich of fibers and water. Like any fruit or vegetable, cucumber must be used within a very short period of 10 days at maximum. The reason for this is that, fresh fruits and vegetables usually contain specific amount of vitamins and antioxidants and the more days they stay in the refrigerator, the more loss in their vitamin content. One of the good advantages of cucumber is that it can be eaten any time of the day, or directly after waking up as it is not dangerous for stomach ulcer cases, unlike tomatoes and other acidic effect fruit. 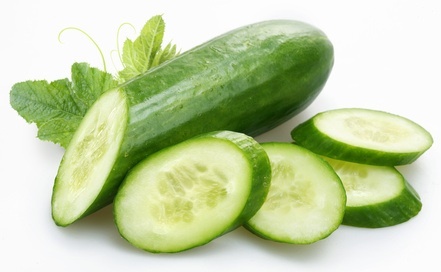 Cucumber flesh is a good source for folic acid and many vitamins such as vitamin A and C, while the skin is highly containing fibers, minerals like potassium, magnesium, molybdenum and silica. Cucumber is very rich in silica, which is a very important trace mineral for the strength of the human body tissues. The reason for cucumber importance as a good supply for water is, it contains ascorbic and caffeic acids which help in preventing water retention, and heal sunburns, swollen eyes, and dermatitis.